If you are new or seasoned coin collector, the PCGS Photograde app for Windows is outstanding at helping you grade your collection. Even if you don’t collect, this app is a great way to learn about the history of the United States through our coins. This Modern app is smooth and easy to use no matter if you are on a touch or non-touch device. Best of all, you get the 30 years of experience of PCGS behind the app to help you grade your collection. Coin collecting has been something that humans have done almost since coinage was invented. Often referred to as the “Hobby of Kings” during the Renaissance, over the past two centuries has become more affordable and easier to do than ever. Those who collect coins seriously, Numismatics, today now have the benefit of technology and applications that even a few years ago was not available. When I started collecting back in the mid-80s, coin grading and cataloging all had to be done by hand. Now, it’s all done with apps but there is – and always will be – a human judgment factor when it comes to grading coins. That is where an app like PCGS Photograde can make it easier for the seasoned collector and those new to the hobby. PCGS Photograde comes from the company Professional Coin Grading Service, or PCGS. They have been professionally grading coins for 30 years now and have had apps on various platforms to help hobbist leverage their experience to grade their own coins. The PCGS Photograde app for Windows is the most comprehensive coin grading app available and gives high resolution photos of a wide range of US coins to help you determine the grades of your own coins. 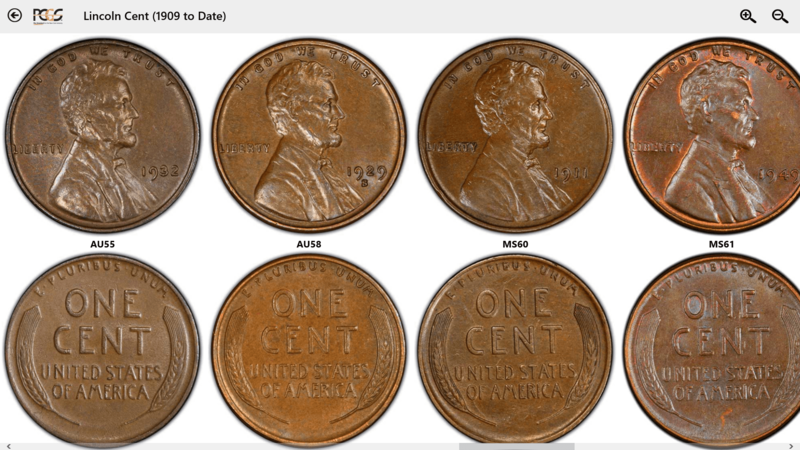 It is a great way to figure out if that Lincoln Wheat Cent is a Fine-12 or an Extra Fine-20 and while that may not sound too exciting, it could mean in some cases hundreds of dollars difference in value. Whether you have been collecting for a long time or just starting out, take a look at the PCGS Photograde app to help you grade your coins. Toshiba Encore 2 which, while it doesn’t have the highest resolution, it is a great for being able to access the app while I’m at a coin show or other event. The app is also completely designed for touch use so using it on a tablet or Surface is easy. When you start the app you will have 14 different types of coin ranging from Colonial coins all the way through to Bullion coins. You can swipe up and down in the app to select the type of coin you want to grade then tap to select it. 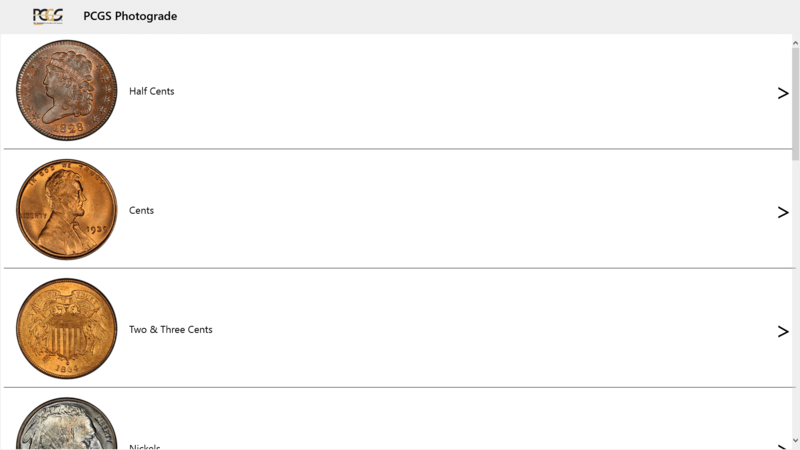 Once you select a type of coin you will then see the options for the different types of coins in that category. Take for example Cents. You will have the sub-types of Chain Cents, Flying Eagle Cents, Indian Head Cents, Lincoln Cents and so forth. In fact, even if you are not a coin collector, the PCGS Photograde app is great for learning a bit about the US through our coins. Once you select the sub-type, you will then see the various grades of that specific coin. It will start for most coins at an About Good (AG) and goes all the way up to Mint State (MS). A perfect coin is MS-70 and the app goes up to MS-68 on most coins. Most collectors, even serious ones, have a really hard time discerning between an MS-68 and MS-70 coin. The difference is so minor that you almost need a company like PCGS to make the final determination. The PCGS Photograde app allows you to zoom in to the images of the coins you are doing a stare-and-compare with on your own coins to help you look at small details so you can make the determination of the grade of your coins. Ultimately with any grading, it is subjective and the only thing that makes you better at it is experience and practice. This is where this app can help by giving you experience at looking at coins and learning how to grade. Further, it gives you the ability to look at coins that you may not have in your collection or maybe never be able to add to your collection. In all the PCGS Photograde app has 86 different coins with over 1900 high resolution images in the app. While not every coin has every grade displayed, the app should provide collectors with a wide range of coin types and grades to both educate and help you grade your own collection. The one thing that would be good to see in a future build of PCGS Photograde is to have world coins (or perhaps a separate app). Having lived abroad for the last couple of years, I have learned to appreciate global coinage and it would be good to be able to accurately grade the coins I collected while abroad. Whether you are a coin collector or looking to learn about US history through our coins, the PCGS Photograde app is outstanding. It works well on touch and non-touch devices and provides exceptionally detailed photos of coins to help you see the details as you grade.